(My initial bet is 0.76 because it gives the highest percentage of profit with a lower value (0.9474%), if betting 0.35 only gives 0.31 (0.8857%). But you like this bot? so clearly when u arrive at martingale step 4 or 5 the bot stop working killing the recovery steps..
do you run your bots on real account Clademilson ? dont worry for your english ,my english is not best..im from france. 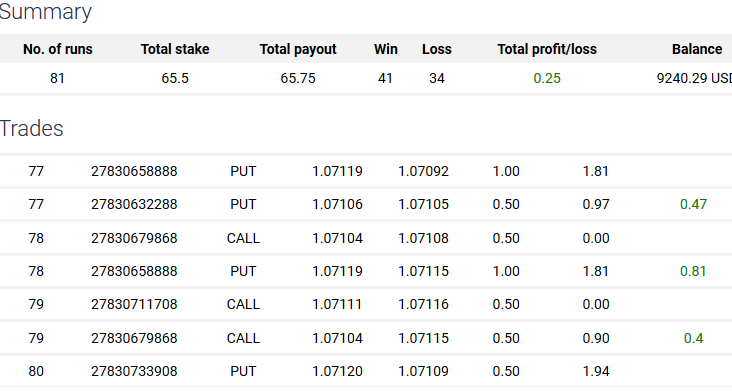 I advise to leave "Expected Profit" in 0.01 for better security ... and leave "Maximum Loss" at 10 dollars. Oi @Clademilson tambem sou do Brasil, estou com várias estrategias, mas não sei modificar sou leigo em programação, pode me ajudar?, preciso add martingale num bot que consegui no github. i used usa sock5 but didnt worked also , do you know where is the list of allowed country ? Pode Adicionar martingale nessas 2 estrategias? Hi, rsi_max and min have to be at 80 and 20 or stay at 50?